Vidya and Ruth Sagar have a very clear vision about what they want to see happening in their community. It has a very strong emphasis on spiritual and educational development for those who cannot afford to flourish. Their work has numerous components; a school, establishing new fellowships of believers, caring for poor children and supporting people in ministry. All of these aspects of their vision overlap to some degree but have been compounded by a lack of resources and slower growth of the school than they expected. This has happened because of government rule changes that insist a school must have a certain sized playground and for them this is not possible to achieve. An adjacent property became available but the small, house sized piece of land was priced at over US$100,000. Many new housing estates are being built in the area but the parents prefer their children to go to a school that is compliant with government rules. They are still able to operate, but it has slowed their growth. When the school reaches it's target of around 500 students it will be sustainable financially although we get the feeling that there will always be plenty of needs the Sagars want to help with. The school model works that many of the children pay little or no fees and are supported by others who pay full fees. In addition to running the school, the Sagars also have 24 children staying with them from very poor families, orphans or from one parent families. Many are runaways who have been rejected by their familes and they are very vulnerable. One family of three children has been with them for many years and although their parents alive, they have abandoned them with Vidya and Ruth because this is a better life for the kids. Bright Hope World personnel first met Vidya Sagar in 2003 while he was in his final year of study at the South Asia Institute of Advanced Christian Studies (SAIACS), in Bangalore. We kept in touch with Vidya over the following years and visited him a number of times. 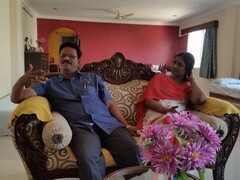 In discussing how we could best partner with him, Vidya decided that the best investment would be to assist him develop and produce a balm/ointment that he could sell to make money to support Christian ministry. In September 2006 funds were sent for that purpose and production quickly commenced (IND10). In 2013 Vidya shared his vision to expand the balm production and therefore extend the potential impact of church planting and ministry. 2013 production was around 1,000 balm products per month whereas increased investment was requested to increase production to 5,000 products per month. This expansion was funded in 2014. Throughout this period Vidya and Ruth were also establishing the Sandra Ricketts School and Hostel but it wasn't until early in 2018, when BHW's India Partnership Facilitator was visiting, that it became apparent there was significant financial pressure on the school. At that stage they had 340 students but needed around 500 to be financially viable. In particular, the 24 children staying in the hostel were placing considerable financial stress on the Sagars. After some discussion the BHW Executive agreed to providing financial support for these students on a decreasing scale over a four year period to relieve some of the stress on the Sagar's and give them time to continue growing the school. 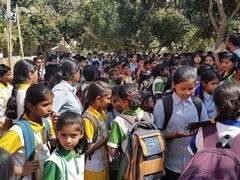 The immediate beneficiaries are the 24 students living with Vidya and Ruth who are being assisted with school fees and living costs which subsequently takes significant financial pressure off the Sagars and enables them to more fully focus on the school and other areas of their ministry. Vidya and Ruth have real compassion for the vulnerable. Their home is literally as busy as a train station. Children and young people live with them in the midst of their busy lives. They are attempting to make their ministry self-sustaining. We have worked with them for a long time now and we know their authenticity. They have a strong commitment to the holistic development of the people are serving. 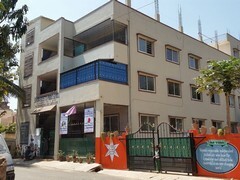 Vidya Sagar is from Andhra Pradesh. He is married to Ruth and has one daughter, Deo. He is passionate about impacting people with the message of the Bible and the Gospel. The number of ministries he is involved in is quite astounding and gives an insight into his heart. Ruth and Vidya run this school as well as a hostel in conjunction with the school as some children come from remote parts of India and Nepal and even from Korea. Vidya is also involved in church planting. There are many poor migrant workers living in Bangalore and he visits three of the squatter compounds to lead church services. Every week people are coming to faith. Many of them are from his own people group from Andhra Pradesh. Every Saturday he meets with around 30 pastors for training and encouragement. He does some of the teaching and he invites others to help him. 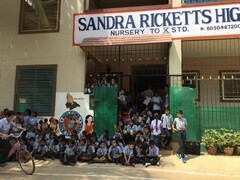 The Sandra Ricketts Public School is "a school that strives to impart a high quality education through English medium. Literary and cultural activities are blended along with academic career, while a strong emphasis is also placed on discipline. 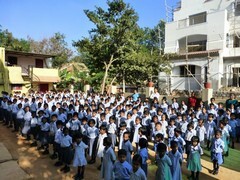 We adopt high methodology for student’s participation in each and every activity of the school." They achieve good results in exams and many of their alumni are developing successful lives.